Soft, strong and waterproof! BPA free. *4m+ weaning Weaning can start from around 4 months (17 weeks is the earliest). Small amounts of pureed food is the best way to get started *The Department of Health recommends that solid food should not be introduced before 6 months, although you can start earlier (but not before 4 months) if advised by your health visitor or GP. Keep mealtimes mess-free wherever you are. 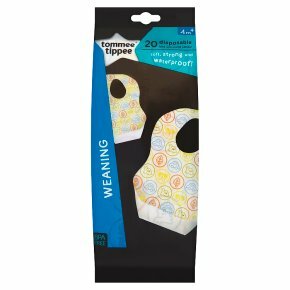 These disposable waterproof bibs fold down to a handy size and have a crumb catcher for even less mess! Please read and retain this important information for future reference. Direction for Use Turn crumb catcher inside out. Open the neck and secure using adhesive tabs. Do not flush this product down the toilet, dispose of with household waste. Never leave your baby unattended whilst feeding. Always remove bib after feeding. Ensure adult supervision at all times. Attach only to the child's clothing, do not attach to skin. Plastic bags can be dangerous. To avoid risk of suffocation, keep the bag away from babies and children. Safely dispose in household waste when empty.<br>Warning! Keep away from fire.